Can I train more? Enthusiasm is good. If an athlete has the time and motivation I never rule out more. Should I train less? Caution is good too. When an athlete isn’t sure about completing the program I listen. Training well is a balancing act: do as much as you can tolerate, but no more. 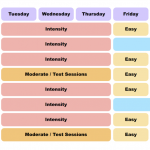 A training plan is an attempt to optimise training, to make the most effective use of our time. It’s not set in stone and there’s room for some adjustments. This may be doing more, holding back or moving workouts. I had to move my morning swim for an early coaching session. When that overran I had to bump a trip to the gym till the evening. Not perfect, but workable. When should you do more? More means increasing stress to the body to drive adaptation. Training longer, harder or more often. As fitness grows so does training load: it takes more to stress the body. The temptation is to rush, but chasing fitness isn’t without risk. Consistency ensures a good progression and performance. Consistency needs an athlete to manage how much they work. Train as much as you can without compromising the quality of your overall plan. If you run for two hours in the morning your unlikely to perform well on the bike that afternoon. You wouldn’t choose to schedule an intense bike session shortly after a long run. Both benefit from your full attention and fresh legs. When considering more you need to decide if you can up the ante in one session and still perform in the others. It’s good to push the limits and test yourself; step outside your comfort zone in training and redefine boundaries. It works well on training camps. But you can’t overreach all year round; you can’t constantly be on that knife edge. Training is about executing each session well and under control. You work appropriately. Sometimes that’s hard, but you’re not driving yourself into the ground. Before you add more ask yourself (or your coach) if you need more. 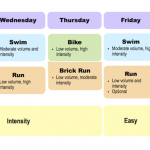 Is your current training load too easy? How tired does your training week make you? Don’t judge by the good days, consider the bad. There’s a reason for bad training days, often it’s too much elsewhere. How is consistency? Are you adhering to the plan? Before you judge it too light consider if you are actually executing the schedule. If not should you be adding more before you’ve manage the basics? Once you’re satisfied you can handle more then consider how. Frequency or volume are safer options especially if you’re unsure. Build how much you do then build how hard you do it. But time constraints are normal. When you’re at the limits of your training time the only way to increase the load is to work harder. When should you do less? As common as enthusiasm to do more are fears about doing less. It’s far easier to get an athlete to push than it is to make them ease up. A single sessions lost could mean weeks of fitness gone? Let me assure you: no single session will make or break your season. Nobody gets fitter by putting less work in. Recovery is required, but without training there’s no stimulus for adaptation. You should be concerned about missing sessions, but keep this in perspective. Consider consistency. Dropping a session breaks short-term consistency, but sometime it’s necessary for long-term well being. I’m slowly increasing my running work load. Week on week I do more, but at times my legs have suffered. I’ve dropped sessions when I suspected I was verging on injury. The consistency of my running is interrupted, but holding back prevents me damaging the entire build. A single session is not worth a season of injury. Training sessions that take fatigue too far, that aggravate injuries or lead to sickness do more harm than good. It doesn’t matter how important it is in the weekly schedule if it breaks the overall progression of your plan it was too much. Training is a balancing act. Sometimes you’ll do too much, sometimes too little; occasionally you’ll be right on the brink. You don’t want to be consistently doing too much or too little. You want to be consistently training. That may mean missing a session, holding back or perhaps stepping up. Think long-term.